Debug BSOD from memory.dmp without a development platform. The application I use and starting to love outside of just using Visual Studio or any other C++ debugger is WinDbg. One of the things that make this application great is that it is free. 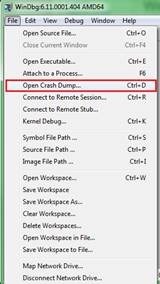 So if your parents are getting BSOD after BSOD you do not have to install your copy of Visual Studio’s onto their machine or try and explain to them how to email the memory.dmp file. 8. If you receive a prompt about saving information for workspace click which ever you like, for a quick look I typically say no. 10. You can then take that file and do a Bing or Google search to find likely causes and possible fixes. This entry was posted in Windows and tagged WinDbg, Windows. Bookmark the permalink.